If international aviation were a country, it would be a top ten emitter of carbon dioxide (CO2), on par with Germany or the United Kingdom. And it’s expected to grow enormously: with more than 50,000 new large aircraft slated to take to the skies, its emissions are expected to triple or quadruple by 2040. In Paris in December 2015, the world hailed the success of the UN Framework Convention on Climate Change (UNFCCC) in adopting the first broadly applicable instrument to start driving carbon pollution down, with a goal of limiting warming to 1.5-2° C.
But Paris didn’t cover pollution from flights between countries. Why not? Because in 1997, aviation lobbied for, and got, the UNFCCC to defer these to another UN body, the International Civil Aviation Organization (ICAO). An ICAO CO2 standard for aircraft – akin to a miles-per-gallon standard for cars. In Montreal next week, possibly as early as Monday, February 8, 2016, a technical group is expected to agree a recommendation for this standard. A cap on international aviation’s total CO2 emissions at 2020 levels. ICAO is slated to vote in September 2016, on the cap and a market-based measure (MBM) to help airlines implement it. 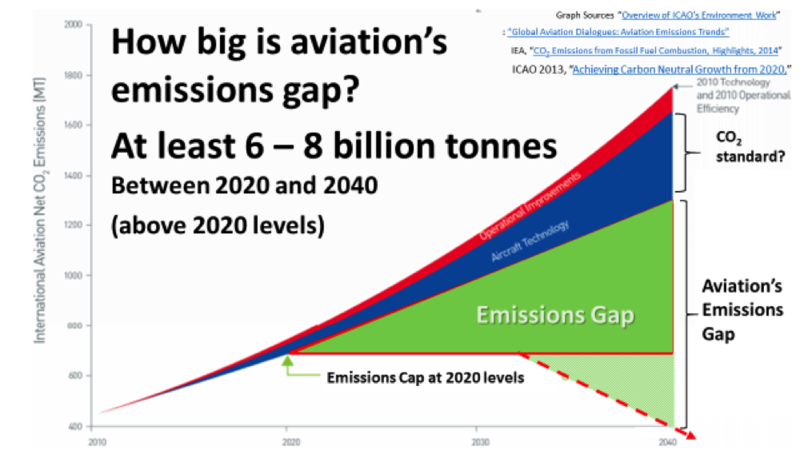 Without any new rules, international aviation’s carbon pollution is expected to skyrocket (top red line). Better air traffic control can trim some pollution (top red wedge). An ambitious CO2 standard would mean fewer emissions per passenger-mile, further slowing the sector’s emissions growth (blue wedge). But because the industry’s overall emissions are expected to far outstrip these per-trip efficiency gains, there’s still a huge gap (green triangle) – at least 6-8 billion tonnes – to get to the goal of an emissions cap at 2020 levels (red horizontal line), or even more ambitious goals along the lines of the Paris agreement (red dashed line). The real prize is the market-based measure to cap aviation emissions and drive pollution down, not up.